Neither Caitlyn nor I have a hunting license, and we’re actually young enough that it’s required we obtain a firearm safety permit before we can even buy licenses, so our first fall in the Northland we’ve had to forego the time-honored and culturally-revered tradition of hunting. 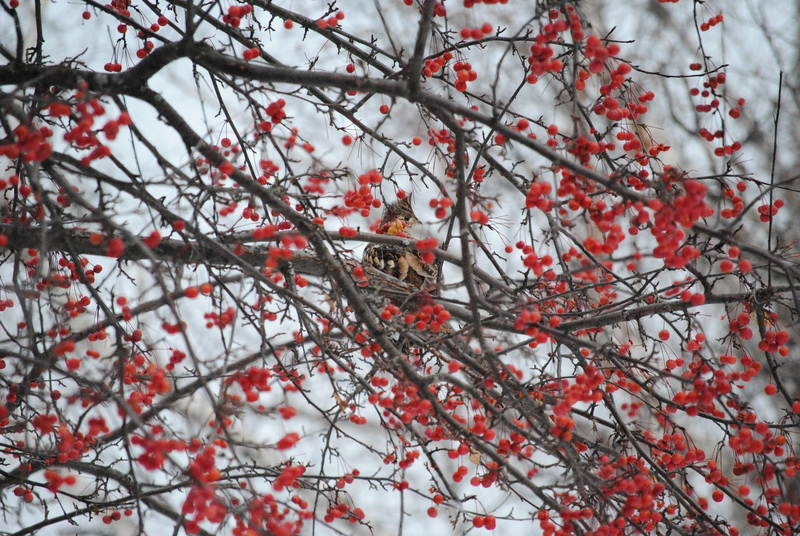 Just the other morning we were munching on breakfast when I noticed a sizeable bird alight in the branches of the large crabapple tree in our backyard. I ran to see what it was, and to my surprise there was a grouse teetering across the bare arms of the tree, nibbling on crabapples. We watched it for a while and Caitlyn snapped a few pictures, and that was it. It flew away after a few moments and that was all we thought of it. The next morning as Caitlyn and Aleah walked into the kitchen early in the day, they heard what seemed like a football slamming into the tall windows facing the lake. Caitlyn came back to the room heralding the news of the grouse’s unfortunate confusion between our unfriendly windows and the friendly branches of the crabapple tree. 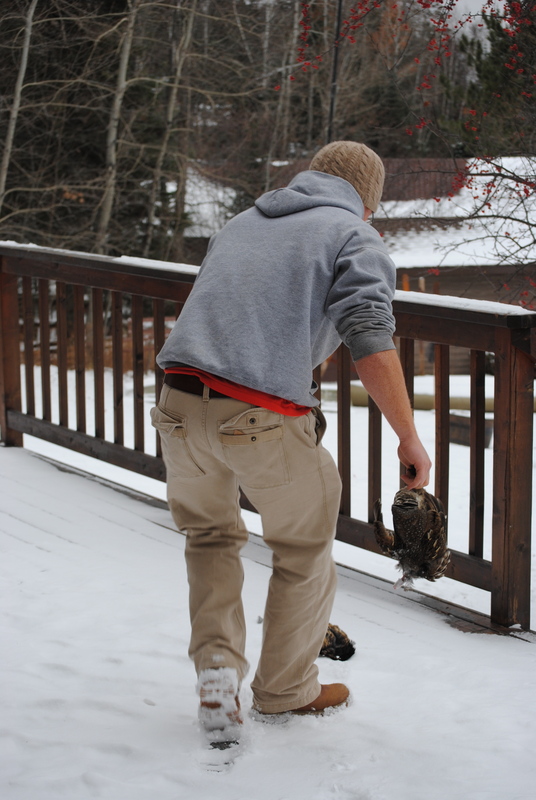 (And yes, grouse are considered a less-than-intelligent bird.) She asked me to walk outside and see if there was any chance of reviving it, so of course I obliged…in my underwear and slippers. The grouse was feasting on voluptuous, juicy crabapples in bird heaven by the time I got to it, and so I left it on the deck and said I’d take care of it when I came home for lunch. It didn’t take me long to find a 60 second “How To” video on YouTube for gutting and cleaning a grouse as I sat in my office that morning, so I returned home for lunch with a plan. 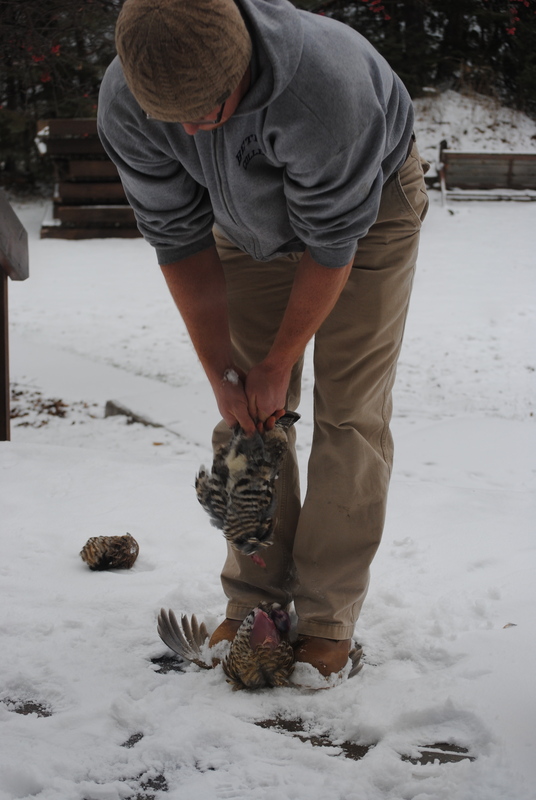 This story is about to take a slightly more graphic tone as I share my first experience with cleaning a game-bird, so if at this point you think it would be in your best interest to simply reflect on my previous comments about bird heaven, by all means, stop reading. For everyone else, let’s move on. 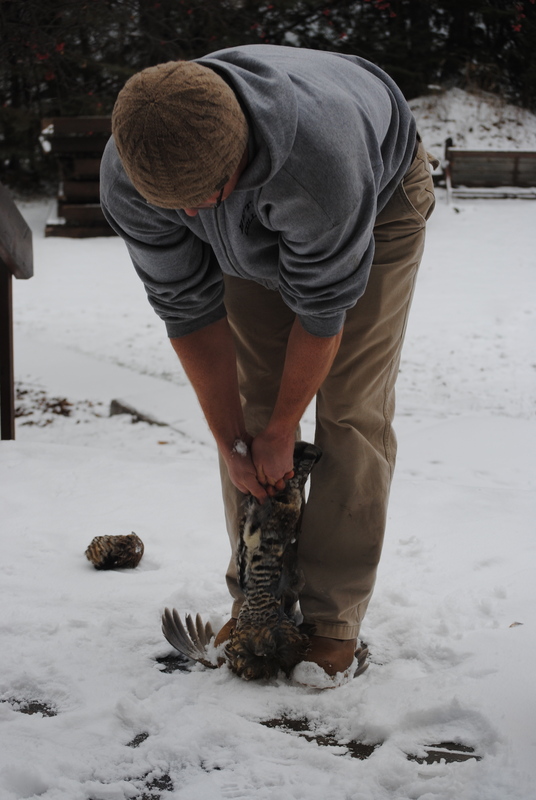 On my drive from the office back home for lunch I made a conscious decision not to wear gloves to clean the grouse. The guy in the video was doing it with his bare hands, and I wanted the real experience, the real feel of feathers and bones and muscle. My first task, to put it gently, was to separate the bird’s head from the rest of its body. This was, in fact, the part I was most apprehensive about. It seemed so savage, and well, uncivilized, but I figured if I could do this in one swift act of barbarism then the rest of the cleaning would seem rather mild. 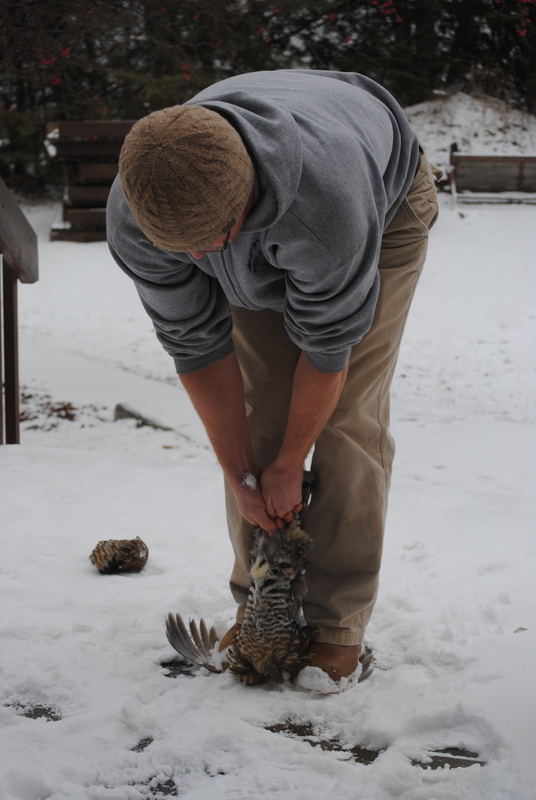 I picked up the grouse, head in one hand and body in the other, and I yanked hard and effectively. 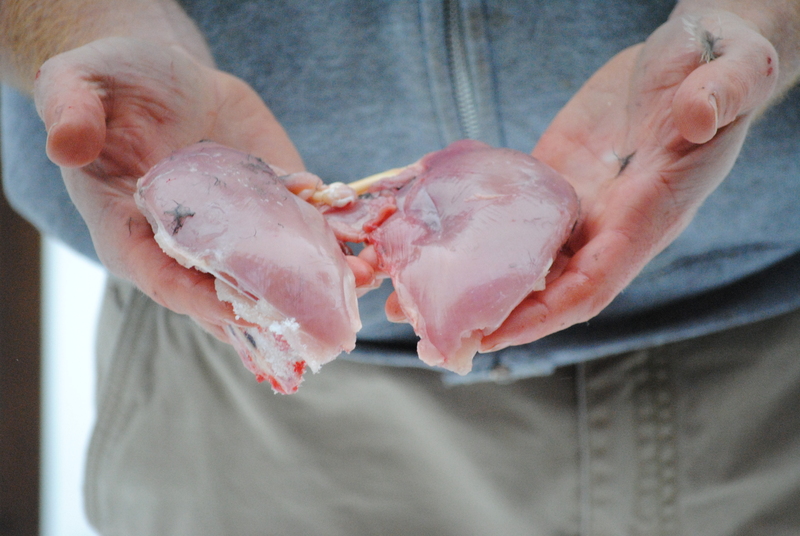 The grouse now lay in two pieces…one with eyes and one with wings. My next task was the most amusing. Apparently, to gut a grouse one only needs to lay it on its back, open its wings, step one foot firmly on each wing, and then grab it by the feet and pull it upward, evenly and firmly. 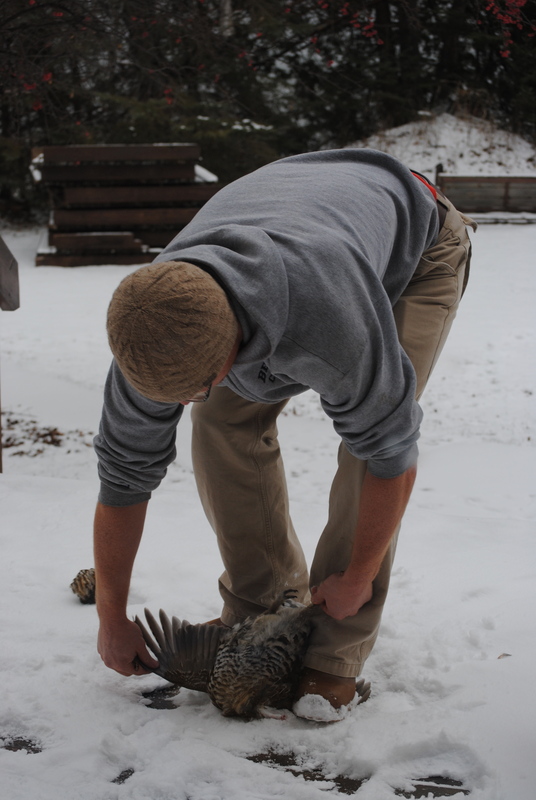 Remaining in the snow then was each wing (firmly beneath my boots), and the grouse’s breast. I should also mention at this point that when I gutted the grouse, a number of freshly gobbled crabapples came spilling out into the snow. It was a lot like cleaning a fish that still has minnows and worms in its tummy. My last task was to simply break each wing away from the main torso and then pull away any remaining feathers. 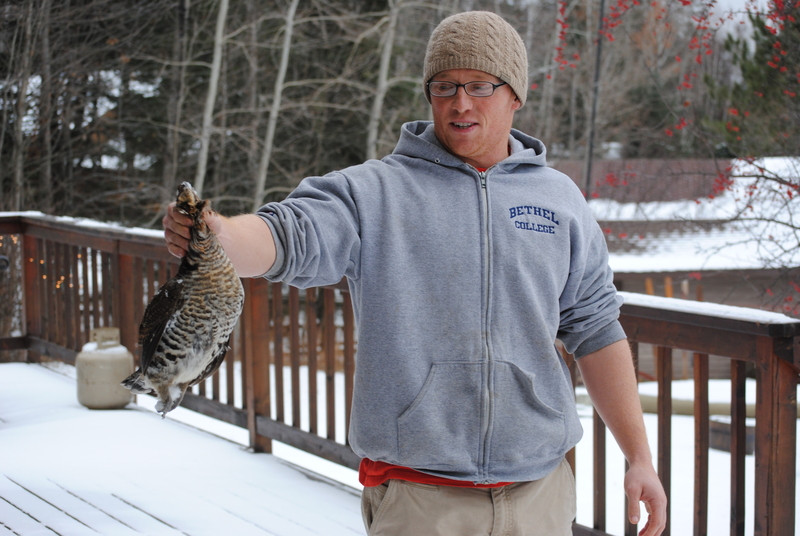 After doing so, I was left with the wonderful breast meat of a northland grouse. I took the meat inside, separated it from the bones and washed it, and then set it in the fridge for dinner. We don’t celebrate the fact that a beautiful wild game bird crashed into our window and lost its life; in fact, we have window clings on our windows to keep this sort of thing from happening. But it happened, and it prompted us to learn a little more about the creatures we share this land with and the goodness they can provide. 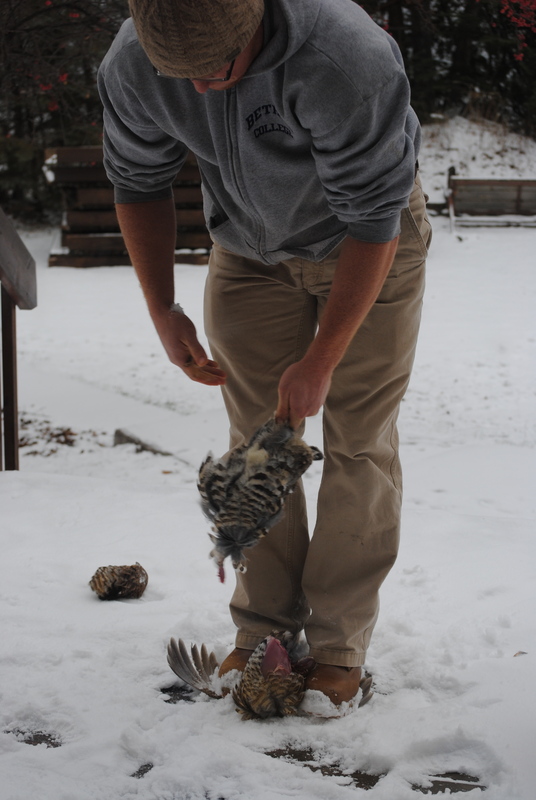 I like grouse. I like the hollow rhythm they create as they drum their wings deep in the woods, I like their markings and the way they can disguise themselves in the forest, and I like the way they taste. That is a beautiful and delicious story!! You need to take hunters safety man! Tell me about it. I’m in the online course right now. I’ll have it by next fall. Lake Vermillion is widely known for it’s savage albeit docile appearing residents. The tales have spread far and wide my friend. Would love to see some of those feathers put to use! It did have great feathers, and the wings were cool. any ideas? Mostly girly stuff .. earrings, necklaces, berets, .. the real challenge would be to make something manly. Very amusing story! Thanks for sharing. Hopefully this was during the girls’ nap time? I loved the references to grouse heaven and the beheading part. You are the man!! !